Every year I try to add one or two new Christmas-themed toys to my inventory. 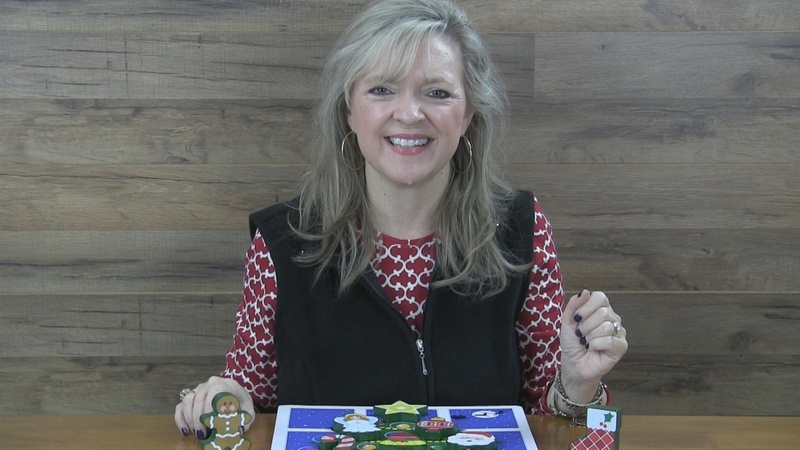 Here’s my favorite new one this year – a Christmas puzzle from Melissa and Doug. (Scroll to the bottom of this page for an Amazon link for this puzzle!) The colorful artwork and chunky pieces make this great for toddlers who are learning to talk and use their little hands! It’s a fabulous toy for working on both language and fine motor development during speech therapy, whether that’s at home with mom or in a clinical setting! · Difficulty matching or knowing where the right piece belongs! · Difficulty making the pieces fit. 2. Limit a child’s options. Use your hands, or even your leg if you’re sitting on the floor with a child, to block some of the spaces so that the correct space and one to two other slots are available. 3. Once matching improves, you may still need to provide some visual cues like pointing or tapping your finger to help them find the correct spot. 4. When a child has trouble making the piece fit, provide enough physical assistance to help them, but not so much help that they resent your intrusion! That usually means that you’ll move their little hands or give the puzzle piece a nudge to get it in the right spot. Some toddlers have a super low frustration tolerance level and get upset when a piece won’t fit. Don’t let them get so frustrated that they give up and move on, but at the same time, don’t irritate them even more by providing too much help. Find that “just right balance” between giving them a little help when they really need it and letting them become more independent. Beyond matching and fine motor practice, you can use this puzzle (and any other puzzle!) 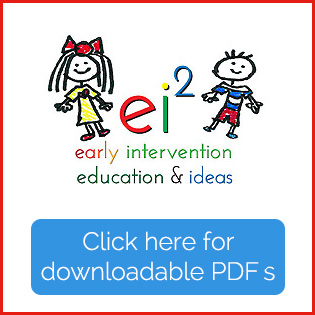 to improve a toddler’s language skills. Of course, for kids who are already talking, you can use this puzzle to teach new vocabulary. That’s fine if a child is already imitating single words, but what about kids who aren’t repeating words yet? Let me teach you my best ways to getting imitation going with some cute play routines that will become natural to you – with some practice! You’ll also be able to use this same strategy all the time – with every toy and during daily routines. To help a child begin to learn to imitate words, you don’t begin with real words – which is a big surprise to parents! Begin by helping a toddler learn to imitate actions. With a puzzle, we model actions as we play with the puzzle pieces. For example, if a child picks up the angel, you might say, “Oh… let’s kiss that angel.” You should kiss the angel a couple of times making it super fun and then wait for the child to copy kissing the angel. If she doesn’t, help her by moving the angel to her lips. Try an action that’s unexpected and funny. Pretend the deer’s horns have poked your finger and dramatically say “Ouch!” Even if a child can’t say “ouch” yet, he can still pretend he’s hurt. If a toddler understands early pretending, he’ll usually try to imitate your overreaction, especially if you make it dramatic and silly. · Make up your own song! In the video, I shared a play routine I use for bells. These kinds of play sounds are so much fun for all toddlers and “in – between steps” for toddlers who aren’t yet talking as well as you’d hope. 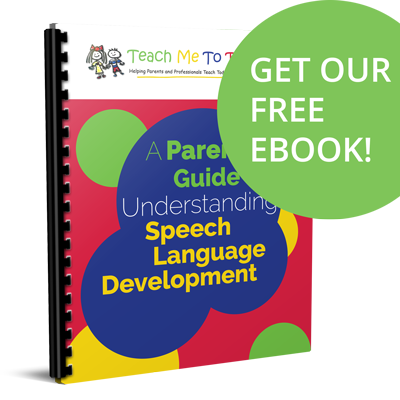 By introducing speech-language skills in this very systematic way, you’ll be able to move a child from being non-verbal to saying real words and then finally talking in phrases and short sentences. If you’d like more specific instructions for how to do that, I’ve done all the work for you! 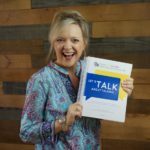 My book Building Verbal Imitation in Toddlers walks you through that entire process. You’ll get a chart to remind you of this progression and TONS of practical ideas and advice for helping a late talker begin to imitate you. Get the puzzle for yourself! ← There’s Still Time for CEUs!